We had a lovely day at Busch Gardens although it started off with a bit of a fizzle. (Instead of a sizzle.) We had parked the car and were blithely (and rather smugly, I might add) bypassing the very congested area where people were forming long lines to buy tickets. We sashayed right on through the crowd and sailed right up to the entrance where I opened my little bag with a flourish and prepared to distribute our four complimentary tickets. I’ll pause here for a moment and let you fill in your own blanks. Done? Okay, now I’ll tell you what my husband did. He was quiet for about ten seconds and I knew that a few “interesting” thoughts were probably percolating in his head. But all he said was, “Well, let me go back and buy another ticket. You all go ahead into the park and have fun and I’ll meet you in about an hour.” And he didn’t mention it again all day. Now don’t you think he needs the Husband of the Year Award? I felt bad enough as it was and he was so wonderful not to make me feel any worse. After that inauspicious start, we had a wonderfully relaxing day. Anyway, I had already chickened out of going on a roller coaster earlier that day. That unfortunate incident involved me standing in line with Nathan for about thirty minutes and then, right as it came time to board, losing my nerve and making my way (going in the wrong direction) through a line of about 300 people. It was pretty embarrassing saying, “Pardon me, ‘scuse me” that many times and announcing to everyone by my exodus that, yes indeedy, I was a ‘fraidy cat! So after that egregious egressing experience, I was extra determined that I was NOT going to back out of the next roller coaster riding opportunity. I patiently stood in line with Nathan as we awaited our turn on the instrument of torture. At long last, we got strapped in and took off. And when I say took off, I mean, TOOOOOK OFFFF! But then all of a sudden, the dreadful thought occurred to me: The ride was not done. Indeed, the ride of terror had just begun. WHOOOOSH! we flew off down the track. WHAM! we turned sideways, back and forth, a hundred times. WHEEEE! we plummeted straight down toward some water. WHOOAAAAA! we ripped around several corners. It was bad, but I was hanging on--screaming, yelling, hyperventilating, but all in all, still in pretty good shape. But then, to my everlasting horror, the ride REALLY took off. I closed my eyes as tight as they would go, grabbed on to my little shoulder harness (which I was convinced was going to let go of me at any second) opened my mouth and just WAILED. Yes, ladies and gentlemen, I actually CRIED on a roller coaster. Nathan told me later that he looked over at me and was filled with a terrible horror that he was responsible for taking his mother on a ride that was making her cry! But what was he supposed to do? Call Steve on the cell phone? Ask for the ride to be stopped? Offer me a Kleenex? A few seconds (or years) later, the cars finally careened into the station and there I sat in front of the whole waiting crowd--tears dribbling down my cheeks, nose running, and terror oozing out of every pore. I didn’t have the wits or the wherewithal to look around me but I wouldn’t be surprised if one glance at me sent all the middle-aged moms running and screaming in the opposite direction. I know for a fact that I wasn’t very good for business. The next day I was telling a friend about the experience and she had the temerity to say, "Oh, my 8-year old daughter just loves that ride." One of the MILD ones!!! I couldn’t believe it! I cried on a MILD roller coaster? I sniffled on an easy peasy ride that 8-year olds adore? I shed all those traumatized tears over stinkin' NOTHING? Here I had thought I was on the worst roller coaster that the Engineers of Horror had ever come up with and I was just sure that my stricken tears were more than justified. And then I found out it was mild. Mild, I tell you! Moment of silence please, while I just get over it. 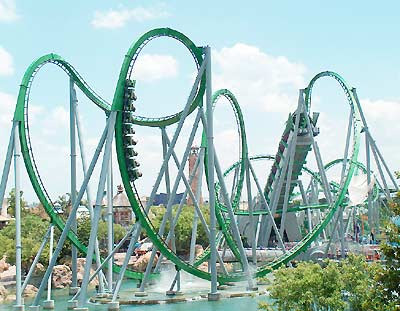 and has made its name in the list of the world’s best roller coasters. The best part of the ride is that at the beginning, it accelerates from 0-40 in less than two seconds. 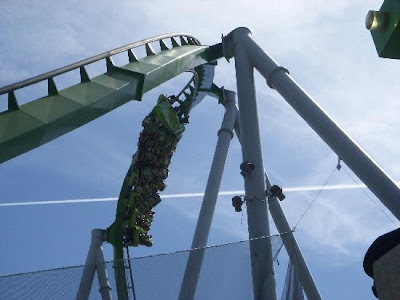 Then you head into an inverted zero gravity roll and go down a 105-foot drop and through a cobra roll that, in 1999, was the world’s largest. Riders complete a vertical loop, then enter a tunnel full of mist. By this time, the speed of the train has reached its highest speed --aproximately 65 mph. Also, during the ride, the train pulls 4 G's." During that horrific, horrible, horrendous ride, I screamed until I thought I would pass out. I saw my life flash before my eyes. I knew I would never again see the faces of my husband or daughter. It was over. My Life. Was. Over. When I had miraculously survived till the end of the ride and we were pulling back into the station, Nathan (who was only fourteen at the time) looked over at me and inquired worriedly, "Mom, are you emotionally damaged?" I forgot all about the terror and just laughed and laughed at my funny son. And then, when I was done laughing, I made a solemn promise that I would never, ever, ever get on that roller again. And I haven't. And I won't. You're a great mom...because you bond on roller coasters! I refuse to do that! We live very near a Busch Gardens park, and one day as we drove by Mary pointed out the roller coaster that a very good friend of mine was willing to ride with her. That friend is now my best friend and has a very special place in my heart because she did something for my daughter that I simply cant do! Chilly Air. Messy Hair. A Happy Pair.